HARRISBURG — The Spirit of Oneness Holistic Expo continues today at the Scottish Rite Cathedral in Harrisburg, PA. 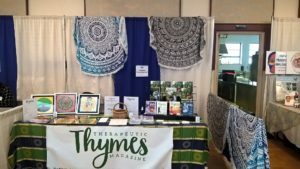 The expo offers two floors of readers, healers, massages, aura photography, crystals and gems, art, jewelry, Therapeutic Thymes Magazine, and more. There are also talks scheduled throughout the day, as well as live entertainment. You will enter the expo from the 3rd Street entrance. Vendors are located both on that main level when you enter and downstairs. The expo runs from 10 a.m. to 5 p.m. today. You can find us in the upper room straight back as you enter (booth C42). That’s our stand pictured on the right here. We have back issues available, and the current issue (Fall 2018). We also offer subscriptions. In addition to the magazine, we have mandala cloths. You can use them for your beach cloth or a table cloth, or even a wall hanging. They are a large circle shaped 100% cotton cloth. There are two choices: one is a blue gradient, and the other is black and has a ring of elephants worked in the design (which to be honest, is what caught Jeanne’s attention!). We also have a selection of artwork by Lititz (PA) area artist Shaun Hutchinson. He offers a Celtic Tree, a Mucha style woman, and a Watercolor Mandala. Yesterday, we were blessed to be near author Amber Nightingale. A review of her book Reiki Healing for the Modern World was included in our Fall 2018 issue. She was there offering book signings and tarot reading. Crystal Sage (out of Maryland) is there this weekend and they have new autumn scents. I picked up a couple Pumpkin Spice bath bombs Saturday. Today, I actually have a list of things to get from them (soap, a few more bath bombs, lip balms, some sprays – stocking stuffers!). Judy Kay, a psychic medium, is offering readings there this weekend. She is incredible. If there is something you seek, advice or information, consult with Judy. Her schedule fills up fast though. If you are looking for crystals, check out Odds and Ends Corner. Zak is downstairs this weekend and has tables of crystals and geodes from which to choose. Shopping for those unique holiday gifts? Check out Rustic Magic & More. This was the first I had seen Jim Caufield’s work but wow – he is very talented. He offers “fun, useful, and magical things made with sticks and other natural materials.” The grapevine works is what caught my attention and drew me into his stand. These are just a quick handful of the talented vendors and readers who are at the Spirit of Oneness Holistic Expo this weekend. Special thanks go to Sharon and her team at the Alta View Wellness Center for putting on the expo each year. The Scottish Rite Cathedral is located at 2701 N 3rd St., Harrisburg, PA. There is plenty of free parking in the parking lot opposite the street from the venue. © Therapeutic Thymes, LLC, 2018.